O-baby. It's playtime for baby that's unmistakably oball. The world's favorite geometric ball that's easy for little hands to grasp brings you the O-play activity gym. Playtime takes on a whole new dimension as baby is surrounded in bright colors, geometric shapes and baby motion-activated lights and melodies. The giraffe marquee toy features 8 melodies and can be set for motion-activated response or play continuously for 20 plus minutes. The prop pillow supports baby for tummy time play. 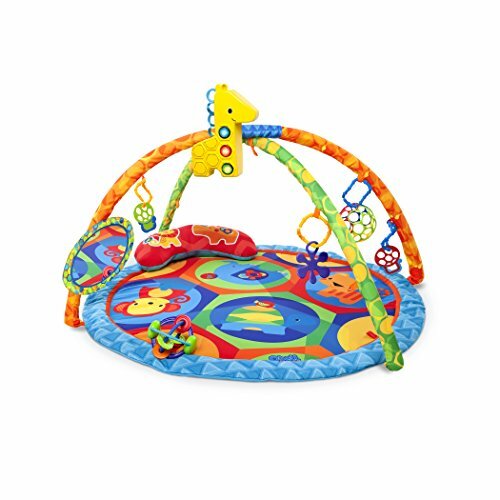 Toys include a baby-safe mirror for self-discovery, the classic oball original, the twist o round with sliding beads and teethable surfaces, grip 'n teethe keys and plenty more. 8 O Ball links to add more toys to keep playtime fresh for baby. Play mat is machine-washable. Get a grip on playtime.